Have any general questions about the ALSC Blog? Want to know to know about ALSC as an organization? We’d like to hear from you! Please post a comment below and we’ll try to help you as best as we can. Think of it as asynchronous virtual reference! Hi Monica. Thanks for reading the post- and a special hello to another “Darien Librarian!” I’m not sure I agree with the assertion that the letter “Y” is wrong. I guess depending on how you were taught to trace (and the generation in which you were taught) influences how letters and numbers “should” be written, when pencil should lift from the paper, etc. I am personally of the philosophy that there is no right or wrong way to trace a letter, necessarily, as long as the end product is legible. That said, this particular app, in the case of the letter “y” is a bit rigid. The tracing guide instructs children to trace the letter in a particular way. It’s not a perfect app, but compared to many other letter and tracing apps I’ve seen, a very good one. We’ve had many parents and children use it on our mounted iPad and so far I’ve only received positive feedback from our patrons. Hi, I have a question regarding the legality of recording and posting story times on Youtube. We want to do this at our library because we have some kids who can’t make it to the library for regular Story Times. Basically, I want to know whether this violates copyright because we’d be reading the whole story. We wouldn’t be showing any of the patrons’ faces (we’d probably still have them sign waivers just in case), but that shouldn’t be the major legal issue. Thanks for the advice! Basically the article notes that storytelling is fair use, but that there are four factors in regards to fair use. My advice would be analyze these four factors and see if your video falls under fair use. Good luck! hi there, just reading about ipad use in the library. I work in an industry that provides accommodation to families for long periods and we’ve received a grant of some ipads to load out to the children. Do you use an anti-theft device? how do you stop them from being stolen – and make sure they always are returned? Could you please email me? I would like to post the blog, Disability in Children’s Books by Renee Grassi, as a guest blog on our website, http://www.thisisliteracy.ca/, with the appropriate credits to her and the site. Thanks for checking. Please be sure to link back to this post on the ALSC Blog at https://www.alsc.ala.org/blog/2012/11/disability-in-childrens-books-blog-series-part-2-2/ and credit Renee Grassi. I know it’s been a few months since your question, but I am only now seeing it. I just wanted to say thank you for sharing my post with your online community. Please let me know if you or anyone has any follow-up comments or questions. I am always happy to help. Thanks again! Interested in a review, doing a guest blog post, whatever to spread the word about this book targeting young adult readers. Thank you!! I’m glad you found the ALSC Blog. We focus on topics of interest to children’s librarians… books, programs for kids, technology in libraries, etc. I appreciate that you are interested in posting with us. I’d love to hear about a specific topic you’d like to write a guest post about! Contact me at alscblog@gmail.com. I would like some tips on increasing the attendance of my storytimes. It seems that sometimes I have a ton of kids like maybe 25 and other times only 8. Our library does advertize in the local paper. Any suggestions? Hi. I’m interested in finding out more about toy libraries in Europe, called Ludotecas or Ludotheques. Looking for anyone familiar with them so I could learn a little more, or if anyone has an idea about where to find out more; seems like little or nothing published in English language. You could contact me at ahoupper@ngs.org. Thanks! When is the next ALSC conference scheduled to take place? I’m an elementary school librarian in New York City and am interested in resources to help me incorporate technology in my curriculum. The next ALSC National Institute will take place in September 2014. The National Institute is a biennial conference, but if you’re looking for someone sooner, ALSC also holds programs at larger annual conferences such as the 2013 ALA Annual Conference in Chicago, IL. The program schedule for this conference has not been announced yet, but it should be appearing later this spring. Hope this helps! Hi — I’m wondering if you’re accepting applications for additional bloggers and how I might get more information. Thanks! Hi, Maureen. Thanks for asking! 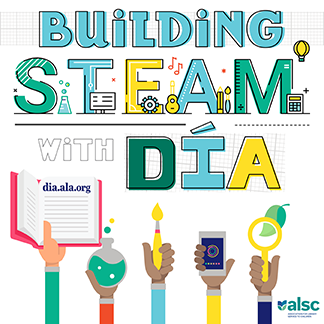 The ALSC Blog is always on the lookout for bloggers — both guest bloggers who can address issues of interest and concern to children’s librarians as well as regular monthly bloggers. All of our regular monthly bloggers are ALA ALSC members. Contact me at alscblog@gmail.com for more information. who was the book seller for the sept.2012 conference? Shirley Mullin from Kids’ Ink Bookstore in Indianapolis was the bookseller for the ALSC Institute in 2012. I am so happy I have found this blog! Love the resources and your bloggers are wonderful. I am a first year grad student in SLIS at Wisconsin-Madison. I’m working on a blog project for one of my classes. I’m wondering if you can give me some “vitals”? When did the blog start? Has its purpose/goal been the same from the get-go, or has it changed along the way? By the way, we were tasked with finding an LIS blog that is relevant to our career goals. I am hoping to work in a public library children’s services area and volunteer time in the elementary school library. ALSC blog is definitely relevant, and quite enjoyable, too! Hi JP, thanks for your nice words. Sounds like a fun project. Why don’t you email me at drude [at] ala [dot] org? I’ll try my best to answer your questions. I have taken on the task of coming up with a list of ways to categorize books in primary school libraries with the Peace Corps. I thought the ALA had such a list. Am I just not putting in the correct keywords? Hi Doug, thanks for your question. Your project sounds fun! The ALA Library has this resource guide called Setting up a Library. I’m not sure if this is what you’re looking for, but perhaps this will help you get started? Thanks! I know there is a ALSC Online Courses tag with all the excellent opportunities offered through ALSC. I was wondering: does the ALSC blog post courses that would apply to children’s services that are presented through another division of ALA? Hi Jordan, if you’re looking for offerings from across ALA, check out the ALA Online Learning section. You can search for courses and webinars via the Children’s Programs & Services tag. Thanks for your question. I assume that you’re talking Dia mini-grants. Unfortunately, yes, only public libraries are eligible for the grant. Part of the requirements and guidelines document states: “Applicants must work in a public library with a demonstrated need and capacity to address the diverse backgrounds within its community, specifically for children from birth to age 14.” Thanks for checking. If you have any other questions, please feel free to email me at dbostrom [at] ala [dot] org. I am hoping that the ALSC blog/blog readers can provide some insight. I have been looking for information regarding centralized purchasing for craft supplies. Currently our 15 branches purchase their own craft supplies according to an allocated budget. Have any other library systems adopted a centralized approach? When you phased in the use of iPads in the children’ s library, did you phase out the children’ s games computers or use both? Please tell me how I might be able to hear or watch the discussions of the nominated books for the Notable list. My book is nominated, and I’d love to hear the discussion online, if possible. Hi Anne, congratulations! These discussions are taking place at the 2015 ALA Midwinter Meeting in Chicago. Unfortunately, we are not able to live stream the discussions. We appreciate your interest and congrats again! Thank you, Dan. Are the discussions made available after the conference? Hi Anne, I’m sorry to say that these discussions really only happen live. They’re open to anyone, but they are not recorded in any way. Got it. Thanks for your replies! Hello, I was just curious when the ALSC Blog was first started? Hi, Tonia! The first blog post on the ALSC Blog was published in September 2007. It’s been growing and thriving since then! same RSS issues? Anyone who knows the solution will you kindly respond? Thanks for your question, when you type your email address into the RSS feed, you should get an email asking you to confirm your subscription. If you don’t get an email, you please check your spam filter. If you continue to have problems, please email me at dbostrom@ala.org. Thanks! Hello, a children’s book that I wrote (Zak’s Safari) is mentioned in a January blog by Heather Ascerro. I’d like to offer to send a graphic of the cover of the book to include in the blog. How can I accomplish this? Congratulations on having a book on the 2016 Rainbow List! And thanks for offering to send us a graphic to use in the post, but unless a correction needs to be made we seldom change posts after publication. I’m a Children’s librarian and would like more information on the recruitment process for a new blogger. I’m definitely interested! Hi, Ericka! We’re always on the lookout for new ALSC bloggers. Drop me an email at alscblog@gmail.com, and I’ll give you more details. I am wondering if any libraries have specific policies regarding adults without children attending story times? We have had one or two issues with this happening. Generally, we consider all our programs free and open to all. People usually self select in to the programs that are appropriate to them (adult oriented or family oriented etc.) Some staff feel like we can’t tell people they are not allowed to attend a specific program but other staff feel it is awkward at best for adults without kids to attend a story time. Any help would be appreciated. I have been trying to find a picture book that I received as a child in about the 1950s that had a picture on the front of 3-5 African American girls who were all dressed up and walking to church. chasing the ghosts of a fool. I love your post about the marshamallow engineering program– do you have a list of books you put out for the kids to get inspired by for the building process? any other information so I can try to recreate this fun idea at my library? Thank you for your blogs and posts on Common Sense Media. I have a supervisor who relies heavily on Common Sense to “screen” books. With that said, I still need a source to check for appropriateness. For example, I was in a 6th grade classroom and saw “Catcher in the Rye” on a bookshelf for students to borrow. My knee-jerk reaction is that the book belongs in high school, but I would like to verify this and offer teachers a site to use to determine appropriateness. If I don’t address this soon, the old fallback of only books approved by the BOE are allowed will be put in place. Do you have suggestions about what site is more reliable? Thank you. I am interested in adding IPads on locking docking stations to our children’s departments. We would not require any internet access. I’ve looked at the AWE computers but am financially unable to make a purchase for our small, rural library. Computers would be available to children 2 to 10 and their adults. Any information and recommendations would be appreciated. I signed up for the PJ Mask library program, not fully realizing what the signup entailed. I thought I was signing up for a program that would be a 1 day activity, not for a 4 week program. This is not something our library wants to do so close to starting our Summer Reading program. Is there a way to cancel my request? I do not want to receive all of the materials for a program we cannot do. The PJ Mask program is not administered by ALSC. They simply have an ad on our home page. Is there contact information on any confirmation you received possibly after signing up? I’ll try to reach out to the individuals who placed the ad and hopefully they can help. How does someone get to post on this blog? I’m doing an homework assignment for my MLS here soon and I was hoping to post a small article along with a survey, if possible. Hi, Shelby! If you are interested in writing for the ALSC Blog, you can contact me at alscblog@gmail.com. (I am the ALSC Blog Manager.) You’ll want to check out the ALSC Blog guidelines as well as the Guest Blogger guidelines. Tell me what you are interested in posting about and how it relates to children’s librarianship and we can see if we can get it scheduled. Thank you for reaching out to us! We’ve forwarded this inquiry to our Public Awareness Office. A representative from that office should be in touch with you shortly. I read today about your organization stripping Laura Ingalls Wilders’ name from an award for a children’s book author. I have read and loved all her books since my childhood. While I can recognize the anti-Native American slant in some books, I think they reflect life as it was 150 years ago . She also shows her father treating Native Americans with kindness in a number of instances. I am upset that your organization should view children’s literature through such a judgmental lens. I don’t think authors who died 60 years ago should be criticized by todays standards. I also think children are capable of finding beauty in great literature while understanding it still may have some flaws. Indeed these moments help parents talk with their children about racism. When you try and sanitize the world you do a great disservice to children and their parents . I have a question and concern as well. I am a trained graduate with my Masters in Library & Information Studies from the University of the West Indies. I have been trying endlessly to apply for a Librarian position in the US but has never been successful because they are always asking for someone with qualifications that are recognized by the ALA . My question therefore is, are third world countries or countries within the Caribbean recognized by ALA? If not what can be done in order for me to be qualified to work as a Librarian in the US? I’m very unhappy about your choosing to remove Laura Ingalls Wilder from the award honoring her legacy. Her writings reflect the era in which she lived. Shielding our children from our nation’s past only serves to have history repeat itself. We are beginning to see some of that as those who disagree with the current administration are stalking, harassing, and keeping members of the administration from enjoying meals and movies with their families. Use these writings to teach our children how much things have changed. Remind them as they read, that this story was set in a different time period (the same way you explain stories in the Bible). Ingalls books are well written and her contribution to literature are well known. Removing her name from this honor is a disgrace. Greetings. I have a question. May I send a newly self-published children’s book to any of the bloggers. Or, may I have a local librarian send you a blog about the book? work in an elementary school library. We have many intermediate students (grades 3-5) who really need to find just right books in the early chapter or easy chapter books. I’d like to change the name of these chapter books so that ALL students will use these books more and to remove any stigma for older struggling readers.